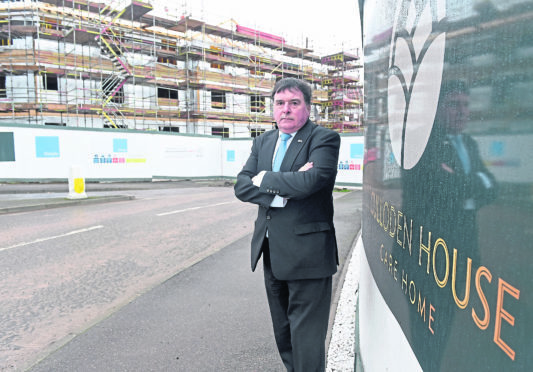 Councillor Ken Gowans of Highland Council outside the currently under construction Culloden House Care Home in Inverness. Picture by Sandy McCook. Owners of a new Inverness care home are under fire for planning to name it Culloden House – despite it being miles from the historic battlefield. The 90-bed home in Cradlehall is currently under construction and an appeal has been made to the owners, Simply UK, to reconsider their decision. Local politicians say they have been left “bewildered” by the name choice, claiming it is highly inappropriate given the historical links with the 1746 Culloden battle. Councillor Ken Gowans has written to owners Simply UK for a change of heart, given that it is not only situated well outwith the Culloden area but that another business, an upmarket hotel, operates under the same name – and is actually sited in the area. He said: “This is causing offence and I have received a number of complaints. “This development is not in Culloden, or even close. There is already a Culloden House in Culloden, which is of historic significance and has direct connections with the Battle of Culloden. “Aside from being an inappropriate proposal, a duplicate name will also prove very confusing. “Culloden is not a brand and should not be treated as such by businesses trying to capitalise on the name. Councillor Duncan MacPherson has also voiced opposition to the name choice, saying he has been astounded by the response from the public following the announcement. He said: “I don’t think it is an appropriate choice of name. It is disrespectful to those who died in Culloden. “Culloden House Hotel is actually in the area and has immediate links to the historic battle. It also has a famous history as it has hosted the likes of former Prime Ministers and stars such as Elton John and Charlie Chaplin. Care home providers Simply UK were contacted for comment but did not respond. On their website, they state: “At Culloden House Care Home every detail has been considered to create a safe and secure environment where later life can be lived to the full. “Set in Cradlehall, a leafy residential area to the east of Inverness, our state of the art care home is designed to provide residents with a level of care and comfort that is unsurpassed.